There are two villas you can choose from, both with the same facilities, similar décor and furnishing. They are fully equipped, each guaranteeing a comfortable and relaxing stay for up to 7 people. 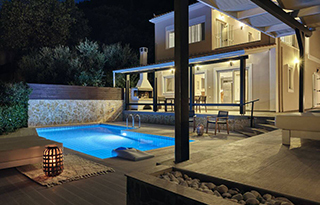 The Aerial View Villas are ideal for families with children, couples and groups of friends looking for a break from reality and a true Greek experience. 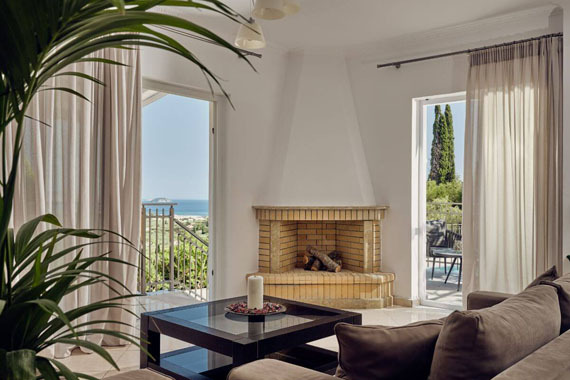 The Aerial View private luxury villa complex is surrounded by scenic countryside and dense olive groves and offers stunning panoramic views over the traditional village of Lithakia and the Agios Sostis bay. The area is traditionally Greek and has not been exposed to mass tourism offering a genuine insight to the Greek way of life while appreciating the exquisite tranquil setting and breathtaking scenery. Enjoy peace and quiet in your own private part of paradise or explore some of the major tourist resorts of the island just a few minutes by car. A lovely well positioned villa, great views of countryside and sea, Very peaceful. The villa was very clean and tidy, it was nicely furnished and roomy. The pool was clean and nice sun beds and umbrellas. The owners were very kind and welcoming.